Welcome back to another episode of Saturday Night Movie Sleepovers! 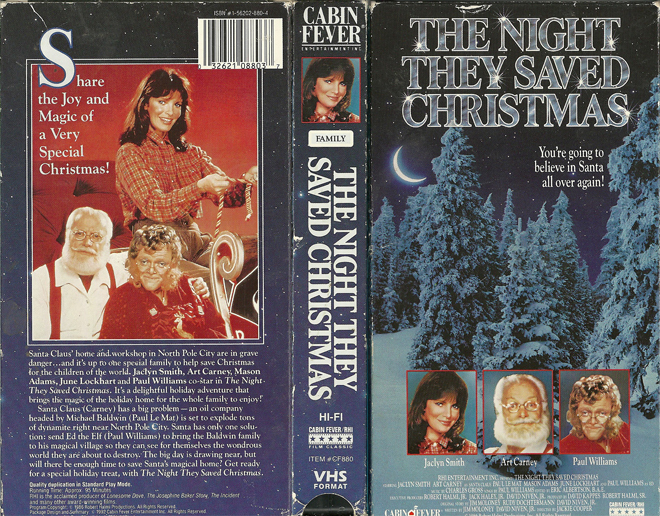 With the holiday season in full swing, J. Blake and Dion Baia have delved quite deep into the video store racks, and found a lost Christmas classic, the ABC made-for-TV movie, The Night They Saved Christmas, from 1984, directed by the great Jackie Cooper! This lost gem starring Art Carney, Jaclyn Smith, Scott Grimes, Mason Adams, June Lockhart and Paul Williams has largely and sadly fallen through the cracks of history and subsequently been lost to time – but not forgotten by the SNMS boys! After Dion and Blake reminisce about some of the classic holiday specials they grew with, the boys jump right into this fabulous film, which the fellas jokingly argue might be the ‘lost’ or ‘unknown’ sequel to the last film they covered on their previous episode, William Friedkin‘s 1977 masterpiece, Sorcerer. They take a deep-dive into this 80’s TV-movie classic and marvel over all those mythical, usually unanswered question regarding the Santa legend, that this film tackles with ease. The guys are equally astonished by the SFX within the film, be it matte-paintings, stop-motion and/or miniatures. And Blake and Dion also offer up some of their unique musical suggestions for the holiday season, to help make the ultimate 2017 Christmas mix-tape. So which one of the boys actually has a huge affinity for Hallmark Christmas movies? Did the boys actually forget to mention that Jackie Cooper was a Little Rascal? Does this film achieve that “Christmas Spirit” that so many look for in a holiday movie? And who the heck is this unseen super-villain Gaylord we keep hearing about?! Well, all these dire questions will be answered in this fun, hilarious and warm, feel-good holiday edition of Saturday Night Movie Sleepovers! Check out this original promo for the ABC premiere of The Night They Saved Christmas! Here’s another original TV promo for The Night They Saved Christmas!